This is a term I am sure you have heard before, but probably not heard it used in the context of engines. Engine failures are not uncommon; all of us have either been the victim of a failure or know someone who has. Most often it is your typical failure, one we have seen or heard of before. Recently, failures that result from a different kind of cause are becoming more common. The Porsche GT3engine has had quite a few harmonic failures as evidenced by the volume of emails I have received and our own unfortunate experiences. Just to put this in context, all engines suffer from this phenomenon. Engines create a continual series of vibrations known as harmonics. Each time the engine ignites the fuel mixture and there is combustion, the forces from these combustion’s act upon thecrankshaft. The forces generated from these combustion’s force the pistons downward which, in turn, rotate the crankshaft. This is known as tangential torques. The rotating and reciprocating masses create torque pulses within the crankshaft each time it rotates. Harmonics are not new. For years the Porsche Boxer engine has been thought of as a neutrally balanced engine with each pair of opposite pistons always in the same position and the forces are counter balanced or cancelled out. Not so. As engine internals have become lighter and lighter to meet mileage requirements the issue of balance and harmonics has become more real.The Porsche engine in the 962C race car had huge issues with harmonics. In the US this engines displacement was 3.0L or 3.2L engine with 70.40mm or 74.40mm stroke using a single lightweightflywheel and a small steel crankshaft pulley to drive the alternator. We saw complete crankshaft failures where the crank would break into two pieces and a lot of camshaft drive failures. The cam drives in these engines were all gear driven. They would “vibrate” so much that bushings in the gear housings would rotate and the roller bearings would starve of oil, seize on the gear shafts, the cams would stop turning and the rotating parts of the engine would often saw the engine in half. Cause = Harmonics. Result = Engine Completely Destroyed. Solution = Custom Built Damper to Eliminate Harmonics. Very hard to diagnose the cause when there is little left to inspect. This was a silent killer. Recent failures seen in the late model Porsche GT3 and Turbo engines are not a Porsche problem, they are an engine problem. Porsche have suggested that these issues have resulted from modifications of the original spec’ed engines. Their Technical bulletin (GT3 Engine: Flywheel and Pulley) speaks directly to this matter. However, the removal of the dual mass flywheelis not the cause. The springs inside the flywheel and the mass of the flywheel have some dampening effect, but it needs to be understood that dual mass flywheels are not harmonic dampers. Dual mass flywheels are used to stop transmission failures, not dampen engine produced harmonics. The earlier 996 GT3 engines came with a rubber “tuned” damper similar to the one used on the earlier 993 engine. Why this was removed from later engines mystifies me when Porsche must have known about the harmonic issue. Regardless, all of the GT3 engines have had engine failure problems caused by the internal harmonics with either flywheel fitted. Even the Turbo engines have had their share. Like a lot of the GT3 failures, the real cause has not been identified and only the result has been addressed. I have read where the camshaft adjusting actuators are poorly designed and therefore are the cause of the retaining screws backing out, not so. This type of thinking and diagnosis stops at the visual result but does not consider nor understand the cause; hence the “Silent Killer” title. Although adding further loctite to the screws cannot hurt, this doesn’t solve the problem. It can just move the problem down the chain. To loosen these bolts the vibration is transferred from the crankshaft into the 1st motion shaft or Intermediate shaft as it is known in the Porsche world. This shaft drives the chains that drive the camshafts. This same intermediate shaft drives the oil pump and the same vibrations that go up through the chains go into the oil pump. The pump gears are made of sintered metal, very brittle and weak material. In their normal function without the inducement of harmonics the scavenge gears are loaded and unloaded on each rotation often scavenging air then oil then air again. The unloading effect causes them to bang backwards and forwards. Now add in the high frequency vibration to a gear made of very brittle material. The keyway groove machined into these gears has very sharp square corners at the root of the adjacent gear tooth. Think you fix one area and the problem moves to the next weakest part! I have been asked why Cup or RSR race engines do not suffer from these same failures. They do, but with some exceptions. First, these engines do not have electronic variable adjustable camshafts so their camshafts have fixed timing. Second, their typical operating RPM range is 5500 and above. The failures seen in the street engines typically happen after periods of low speed driving. Racing these street engines does bring into play other issues, but the harmonic range that causes most of the failures is at lower engine speeds. Continual high speed operation of these race engines above their safety limit has resulted in complete crankshaft failures, just as we have seen in the earlier 962C engines. So how did we come up with the specifications of the new damper? First we had to understand the cause and then we needed to find the RPM range and the magnitude of the pulses. This was done by fitting up special test equipment at each end of an engine along with high speed impulse sensors and inputting this information into some very powerful software. Some of the areas of analysis that can be computed are, angular vibration velocities measured degrees per sec, angular vibration displacement measured degrees, torsion angle orders, energy generated at certain frequencies related to engine speed, and the energy generated at specific orders at their critical engine speeds. Essentially, by running the engine at different RPM’s under load we can measure the deflection of the crankshaft by the tooth count at each end of the engine. We know the degree difference between each tooth on these wheels so the deflection of the crankshaft can be calculated by the stroke or offset of the crankshaft and the degrees of deflection measured. We are extremely grateful for the assistance of an outside company who provided the test equipment and the software. This information is then supplied to the damper manufacturer who can then calculate the size, weight and appropriate sizes of orings required. These new dampers are able to be rebuilt so anyone using one in a racing application can periodically rebuild it. The factory 997 RS pulley is located on the crankshaft by a very small amount of engagement 0.160”, with no interference at all, a small alignment dowel pin and held in place by the pulley bolt. 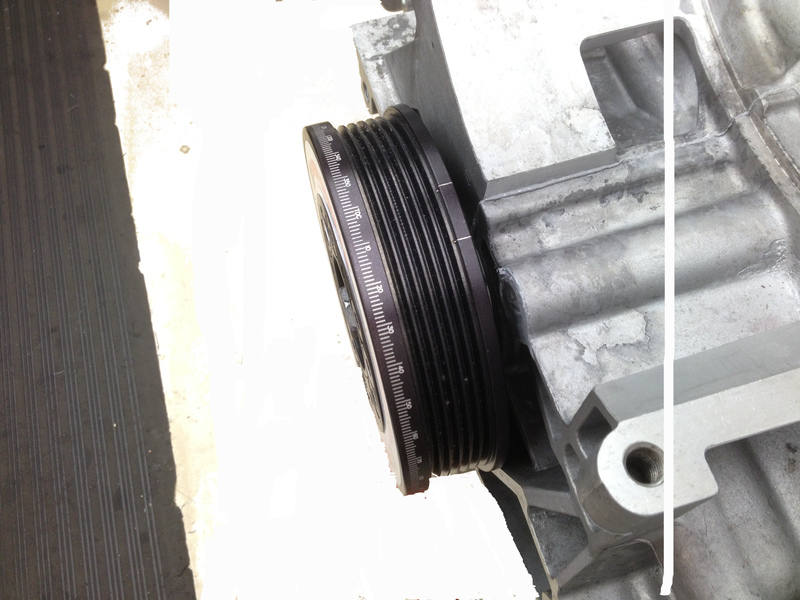 We always see the end of the crankshaft nose showing signs of pulley movement. Earlier I stated where the pulley bolts have come loose.Crankshaft nose end moves, pulley moves, bolt comes loose. This new damper increases the engagement onto the crankshaft nose to over 0.500” almost all the way back to the front crankshaft seal. We have also included interference to the crankshaft nose diameter. The damper is located by the same dowel pin and the original pulley bolt. The outside diameter of the damper is engraved the same as the factory Pulley is. The OEM, TDC, and Timing marks are retained along with full 360 degree increments.